Jenkinson's Aquarium - Are We There Yet? 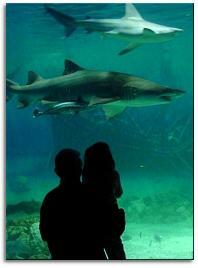 Jenkinson's Aquarium is a privately owned facility located on the boardwalk in Point Pleasant Beach, NJ. Opening in June of 1991, Jenkinson's Aquarium has proven to be a valuable educational and recreational resource, as evidenced by its growing popularity. The aquarium is dedicated to educating the public on all aspects of marine life and conservation. Each exhibit is designed to promote awareness of the animals, their habitats and conservation. Exhibits such as Atlantic Sharks, Pacific Sharks, Coral Reefs, Penguins, Alligators and Seals give you the opportunity to get up close to animals from around the globe. Another attraction, the touch tank, allows visitors to touch live animals ranging from a sea star to a juvenile shark! And you can visit the new Rainforest exhibit, which includes pygmy marmosets  the world's smallest monkeys! Either in the community or at the aquarium, the friendly staff greet visitors in a courteous and professional manner and are on hand to answer questions. The Aquarium also features a Gift Shop that offers an extensive selection of marine related products. Teachers can schedule a visit and tour the Aquarium free of charge with our education department staff. The Aquarium also offered professional development workshops, educational programs for all ages, and Perky the Penguin Birthday Parties. Call (732) 899-1659 for more details. Monday thru Friday, 9:30am - 5pm and Saturday - Sunday, 10am - 5pm. Call to confirm or visit the official website linked above. Groups: Discounts available for groups. Call for details. Group Reservations: At least 2 weeks in advance. Reservations can also be made for the beach, miniature golf, rides, restaurants, and/or the fun house. From the North: Take the Garden State Parkway South to Exit 98. Follow Route 34 South to Route 35 South. Cross the Manasquan Inlet Bridge and stay in the left lane. Make the left jug handle turn a ¼ mile after the Exxon. Complete the turn and head North on Route 35 and make a right onto Broadway (last right before going over bridge). Take Broadway all the way to the end and follow the right turn lane and make a right onto Ocean Avenue. Stay on Ocean Ave and approximately1/2 mile up on your left will be the Aquarium parking lot. From the West: Take 195 East to Exit 35. Continue on Route 34 South and follow above directions from North beginning from Route 34.